Led by Board of Advisors member Lieutenant General Stephen G. Wood, USAF (ret. 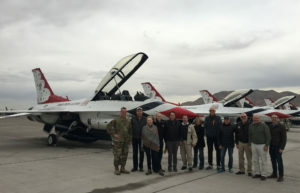 ), a delegation from the Military and Veterans Appreciation Trust Foundation (MVAT) spent December 5-6, 2018 at the U.S. Air Force’s Nellis Air Force Base, located in North Las Vegas, Nevada and at Creech Air Force Base, located at Indian Springs, Nevada. 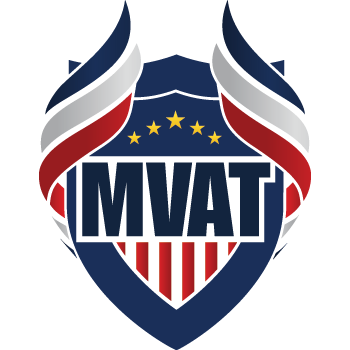 The visit was the third of MVAT’s Veterans of Tomorrow program and was hosted at Nellis by Major General Peter E. Gersten, Commander of the U.S. Air Force Warfare Center, and at Creech by Colonel Julian C. Cheater, Commander, 432d Wing and 432d Air Expeditionary Wing. 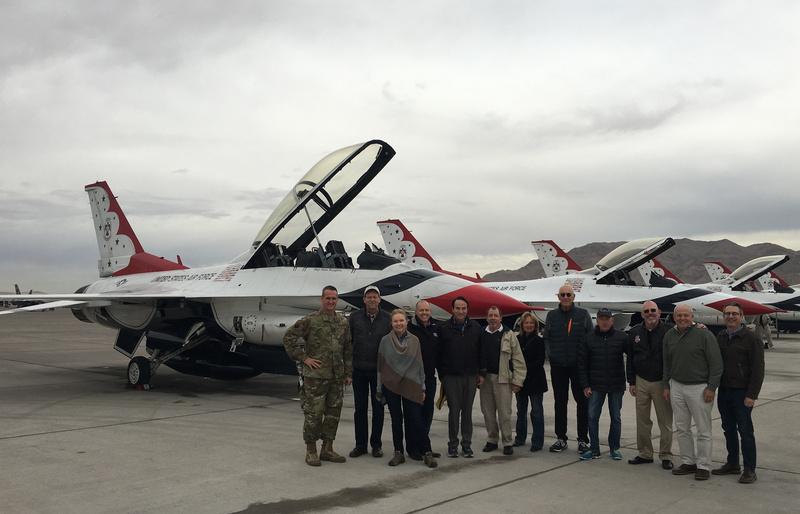 MVAT delegation members with the Thunderbirds on the ramp at Nellis Air Force Base. Lieutenant General (ret.) Wood is second from the right. Major General Gersten is at far left. The Veterans of Tomorrow program provides opportunities to gain a greater appreciation and understanding of American military service members, all of whom will one day be veterans. A critical component of the program is time spent with young service members in their place of work and the opportunity to learn about their motivations to serve, the experiences and challenges the have faced, and their future aspirations. Maj. Matt Kimmel and Captain Michelle Curran of the U.S. Air Force Air Demonstration Squadron (aka the Thunderbirds) speak with MVAT delegation members just after landing their aircraft. Kimmel is the Lead Solo Pilot and Curran is the Opposing Solo Pilot in the 6 aircraft team. During the two-day tour, the MVAT group was fortunate enough to be accompanied by retired generals who previously served at Nellis Air Force Base – the aforementioned Lt. Gen. Stephen G. Wood, who led the base as Commander of the Air Warfare Center, and Maj. Gen. Stephen T. Sargeant, who served as Commandant of the USAF Weapons School, one of the many tenant commands at Nellis. Both generals provided the delegation with insightful information regarding the operations and the complexity of these bases. MVAT delegation members conversed with young USAF personnel during a lunch at Creech Air Force Base. 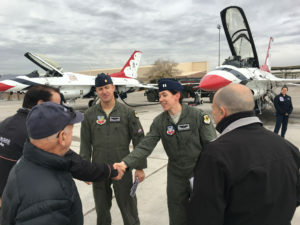 The December 5 program at Nellis AFB coincided with the national day of mourning for the late 41st President George H.W. Bush. As a result of the reduced air operations that day, the MVAT group was able to view every aircraft in the U.S. Air Force fleet when touring the flight line. 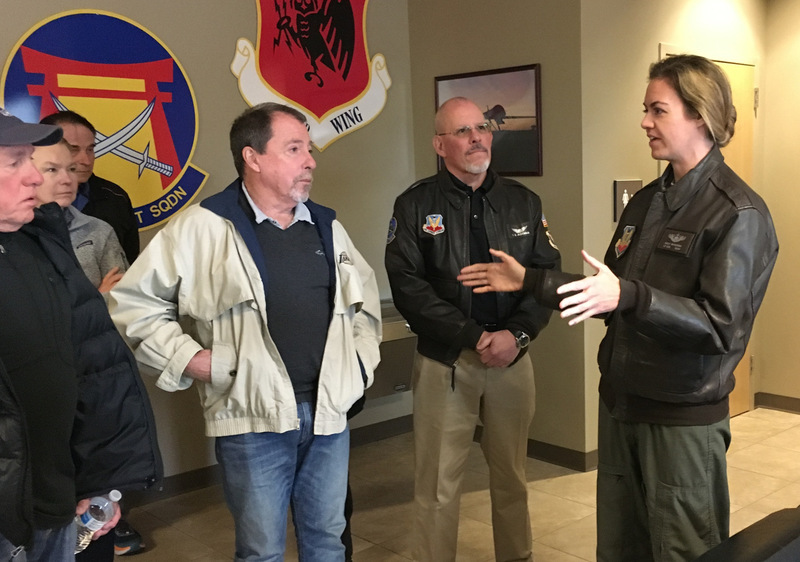 MVAT delegation members speak with Lieutenant Colonel Kaly McKenna, the Director of Staff for the 432d Wing at Creech Air Force Base. Nellis Air Force Base houses numerous Air Force commands and schools as well as more squadrons than any other USAF base. As commander of the U.S. Air Force Warfare Center, Maj. Gen. Gersten commands some 11,000 personnel (active duty, guard, reserve and civilians) located in 22 states. He oversees the operations of four wings, two named units, and one detachment: the 57th Wing, 99th Air Base Wing, the Nevada Test and Training Range, and the Air Force Joint Test Program Office at Nellis AFB; the 53rd Wing at Eglin AFB, Florida. ; the 505th Command and Control Wing at Hurlburt Field, Florida; and Detachment 1, HQ USAFWC at Schriever AFB, Colorado. 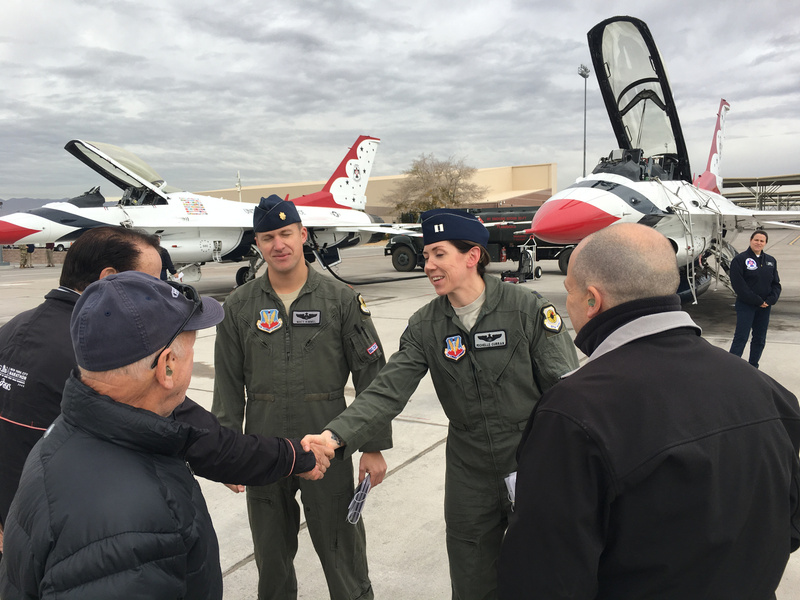 One highlight was an opportunity to closely observe the U.S. Air Force demonstration team, the Thunderbirds, who were practicing their intricately choreographed flight maneuvers that day in the skies over Nellis. Upon landing, the MVAT group members interacted with the pilots and ground crew. 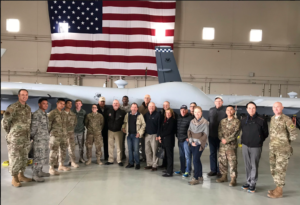 At Creech AFB the following day, the MVAT group received briefings on the operations of the 432d Wing and 432d Air Expeditionary Wing by Colonel Cheater and his command staff. The wing, comprised of some 2,400 personnel, provides persistent attack and reconnaissance worldwide. Creech Air Force Base oversees daily contingency operations and missions of remotely piloted aircraft systems (UAVs/drones) across the world. MVAT delegation members with Air Force personnel at Creech Air Force Base. Colonel Cheater is at far left. MQ-9 Reapers in the background. The 432d is the first Air Force wing completely dedicated to operating remotely piloted aircraft, flown by pilots and sensor operators in the United States. The wing has flown its MQ-9 Reaper (aka Predator B) aircraft in Operations Enduring Freedom and Iraqi Freedom for intelligence surveillance reconnaissance and tactical missions and is currently actively engaged in operations worldwide. The MVAT group was afforded opportunities to closely view the MQ-9 remotely piloted aircraft as well as observe pilots and remote sensor operators conduct training missions. 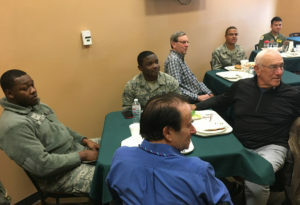 Conversing with young Air Force personnel serving at Nellis and Creech Air Force Bases was a rare opportunity to gain an important understanding of the many factors that motivate young Americans to serve their country. Observing them carrying out their duties and knowing that is what they do year round and at an extremely high level of excellence gave the MVAT delegation a tremendous sense of pride in the U.S. Air Force. One day, every single airman met during the course of the program will become a veteran. And MVAT will be there to ensure they are supported.